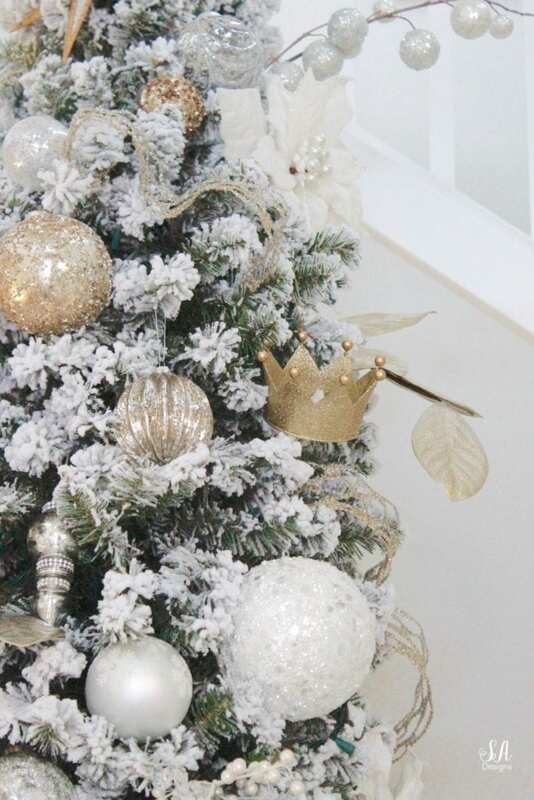 Every year I do a flocked Christmas tree with silver and gold and champagne ornaments and decorations. This year, that is my theme for my entry. 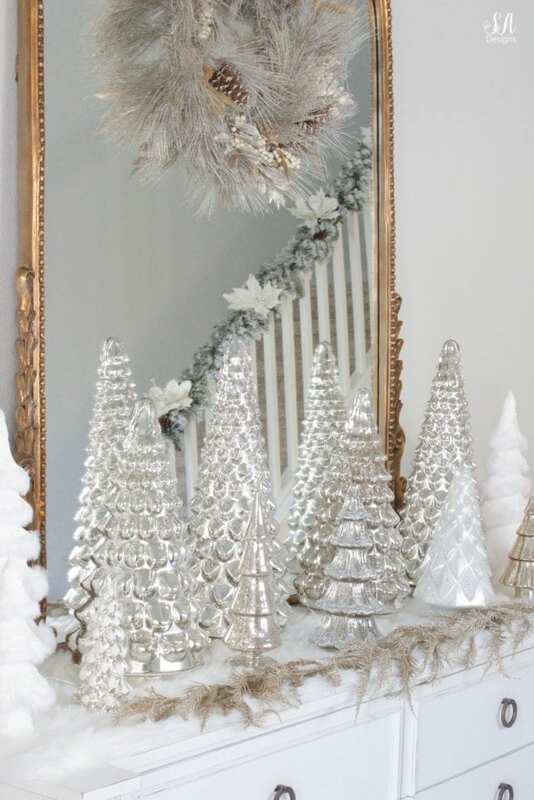 My living room and mantel and kitchen are all being revealed later this week and, although it’s still elegant, it’s more whimsical and has pops of soft color. 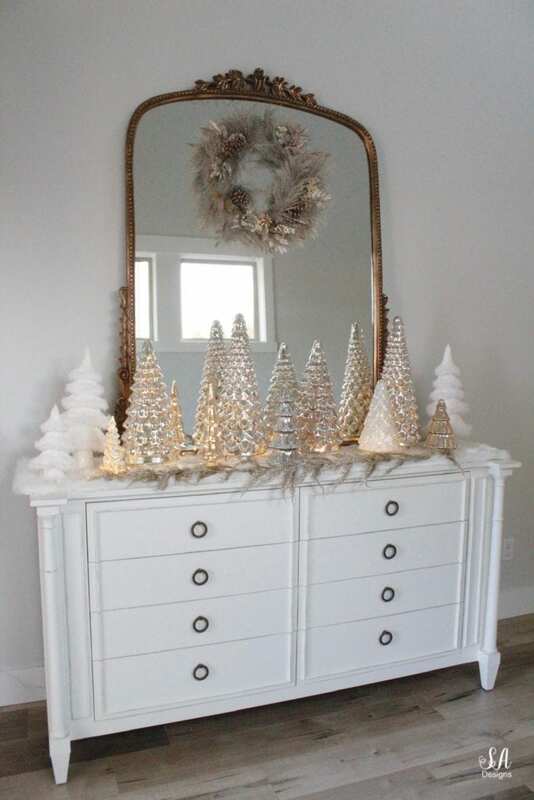 As soon as I saw all the gorgeous mercury and glass trees at Pottery Barn this year, I knew I had to add them to the few smaller trees I’d already collected to create an elegant “forest” on my entry table. 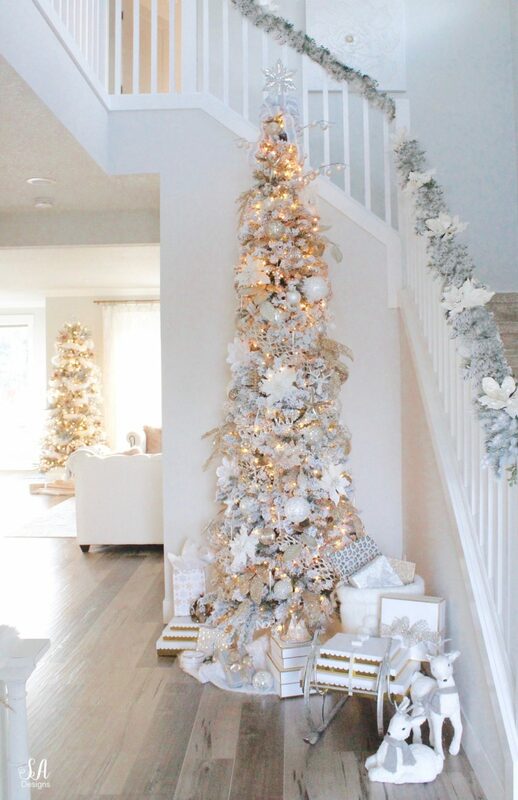 The Pottery Barn trees are absolutely stunning and unlike any other I’ve seen because they come in 3 different heights to really create that dramatic effect. I hadn’t seen them this tall before and it’s exactly what I needed for this space. They also have an opening in the bottom to add my battery-operated twinkle lights. 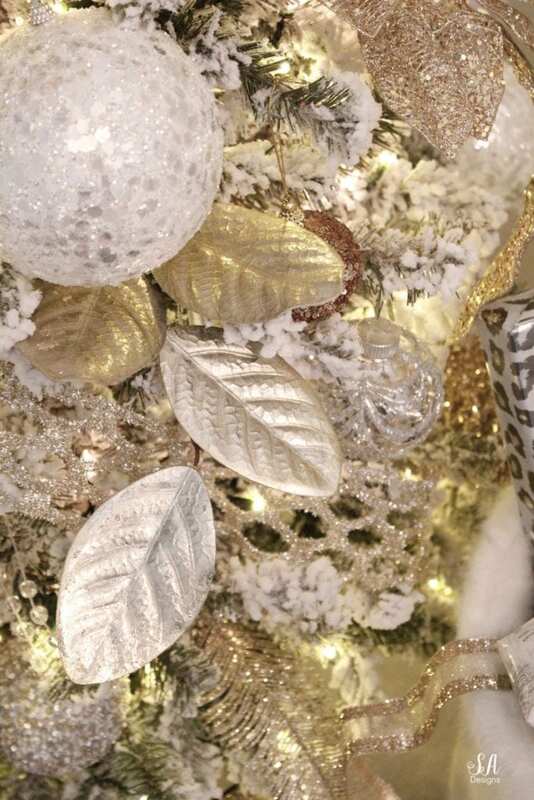 It is sooooo fun to turn them all on at night, along with the Christmas tree lights, and walk into our home. It’s just the kind of experience I envisioned for those walking into our home. 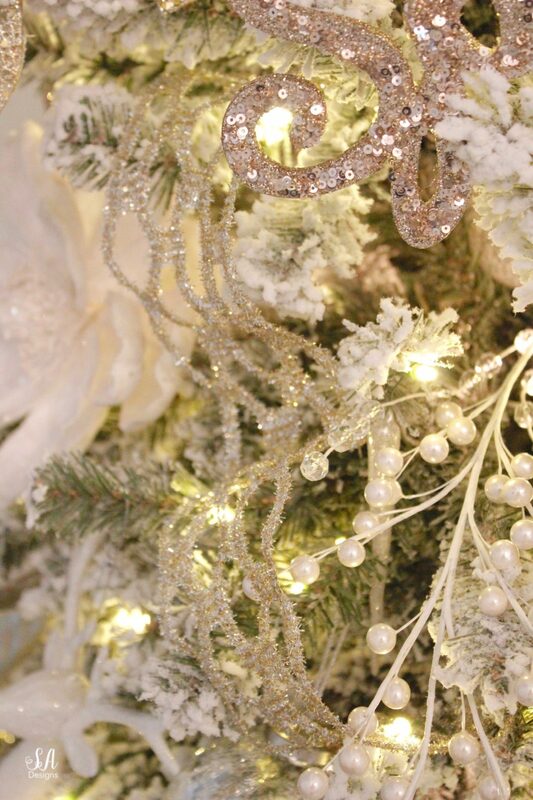 It’s not only elegant but also feels magical. 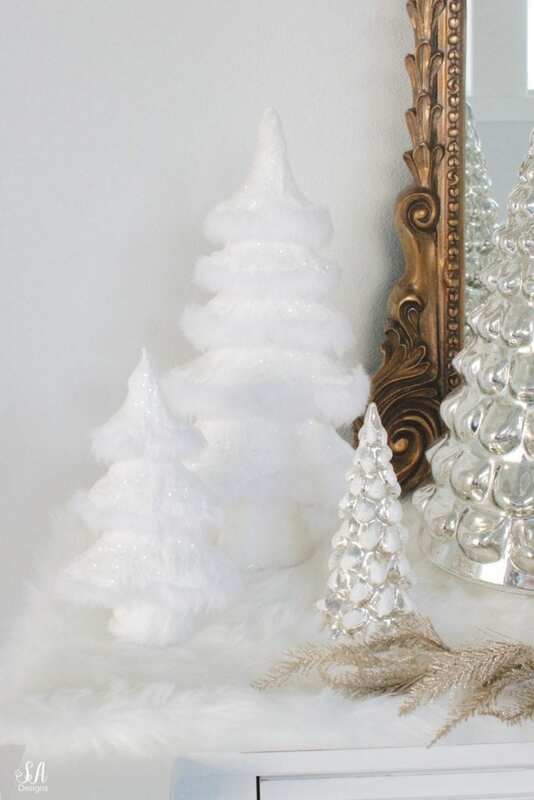 I added these little white fur trees I found last year and placed them on the ends. 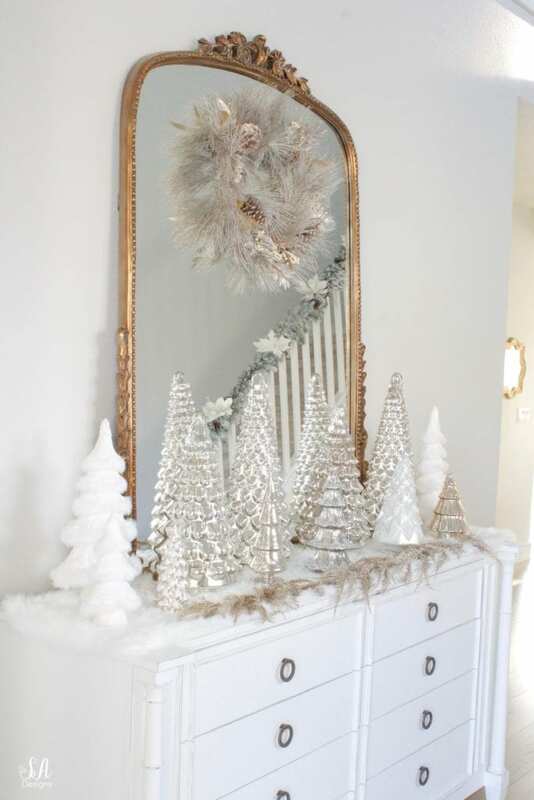 I started with a faux fur table runner on the bottom, added the trees and then placed this lovely gold glitter garland (found at JoAnn’s) across the front. 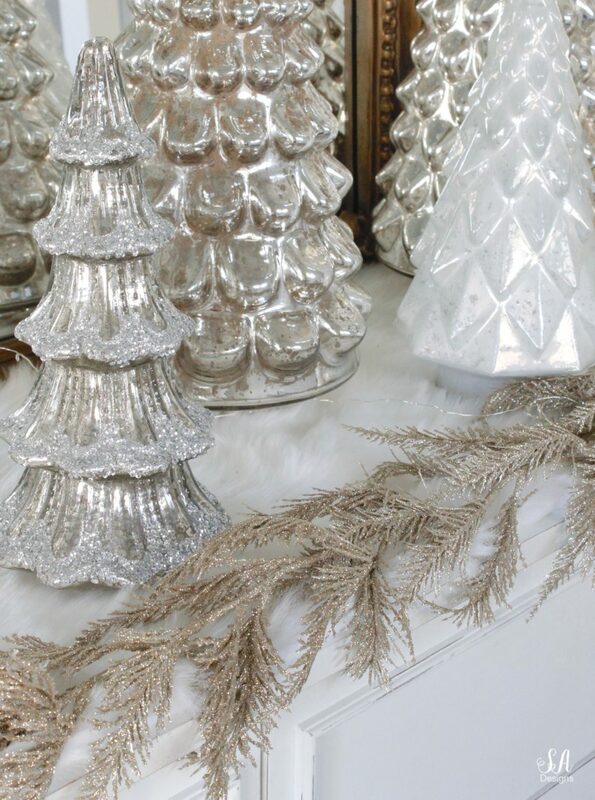 I love the way it all sparkles and glistens! 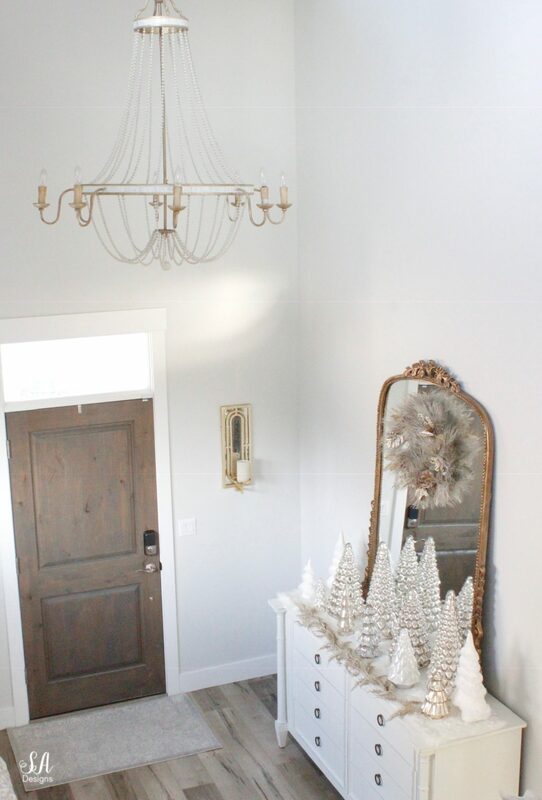 Still loving this tall 5′ mirror I purchased a few months ago! It’s such a stunning backdrop for my trees. 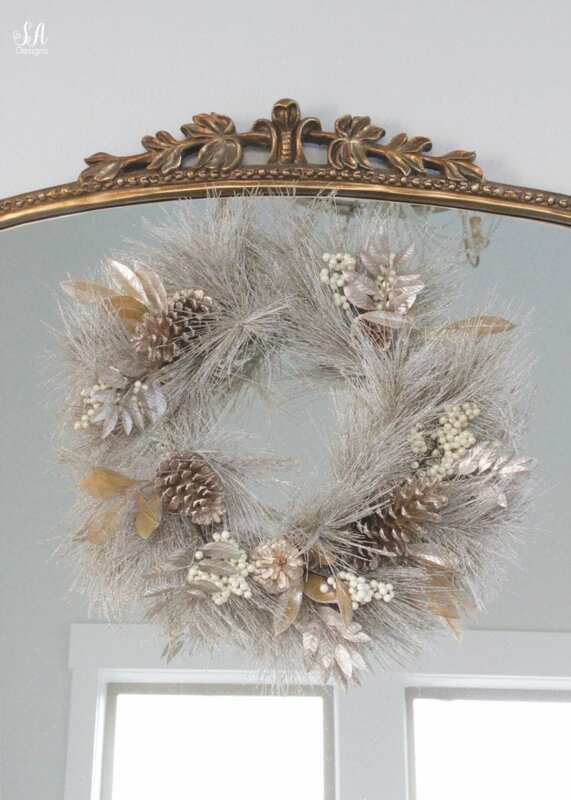 I’ve been looking for a golden/champagne Christmas wreath and was thrilled when I found this one at HomeGoods a couple of weeks ago. It was the perfect addition to this vignette! 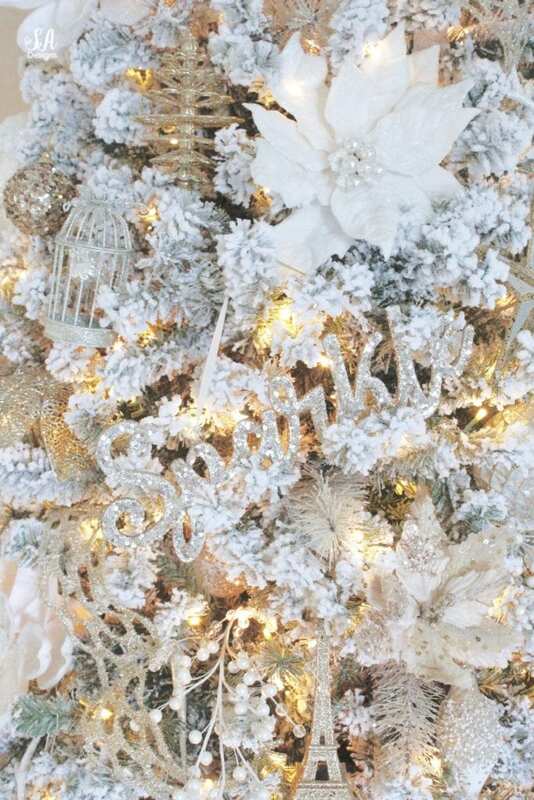 This year I chose a 12′ Flocked Slim Christmas Tree from King Of Christmas. A pencil tree was way too thin and the regular size was way too much, as I didn’t want to brush past the tree on our way to the living room and didn’t want to feel squished in the hallway. This slim version was just perfect for this space. Guess what? It has 6 sections and we actually took 1 off and just used 5, as it was plenty tall. 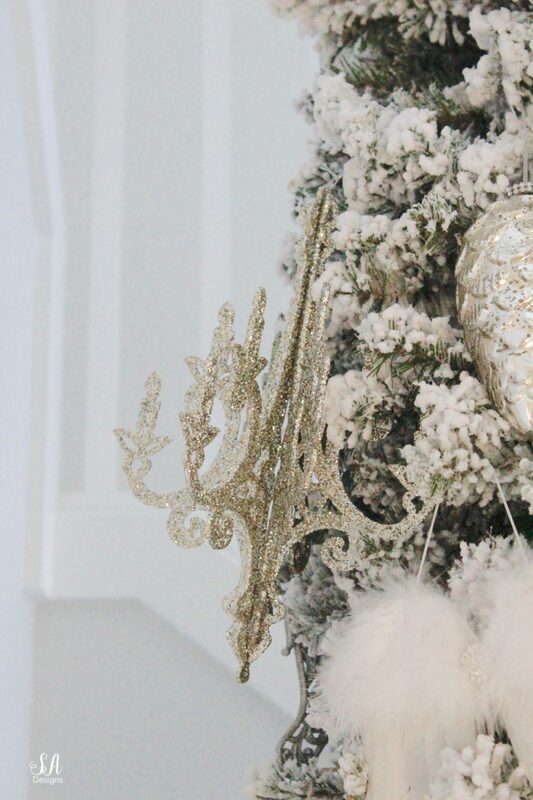 I found the cutest sleigh at a local boutique, years ago. 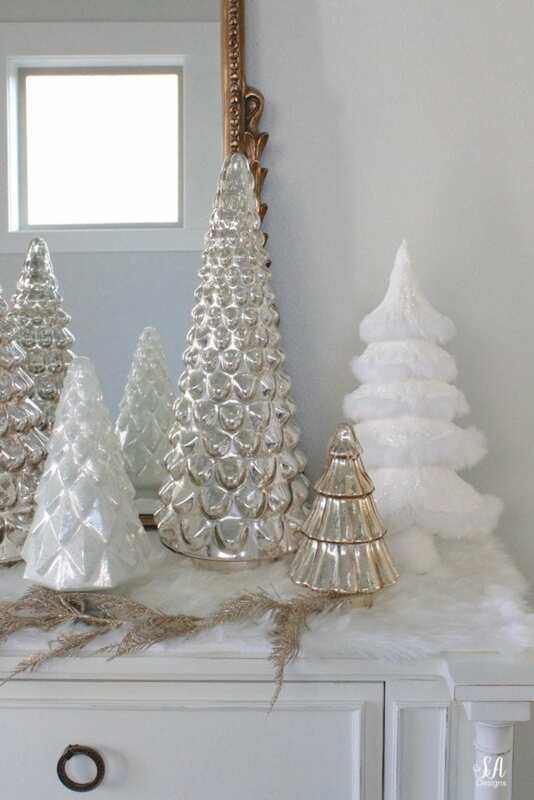 It’s perfect for displaying gifts on, next to the tree, with my cute little dear friends. Brooklyn and Beckham nick-named them “Snowflake” and “Snowball” years ago when they were younger, ha! Isn’t that cute?! 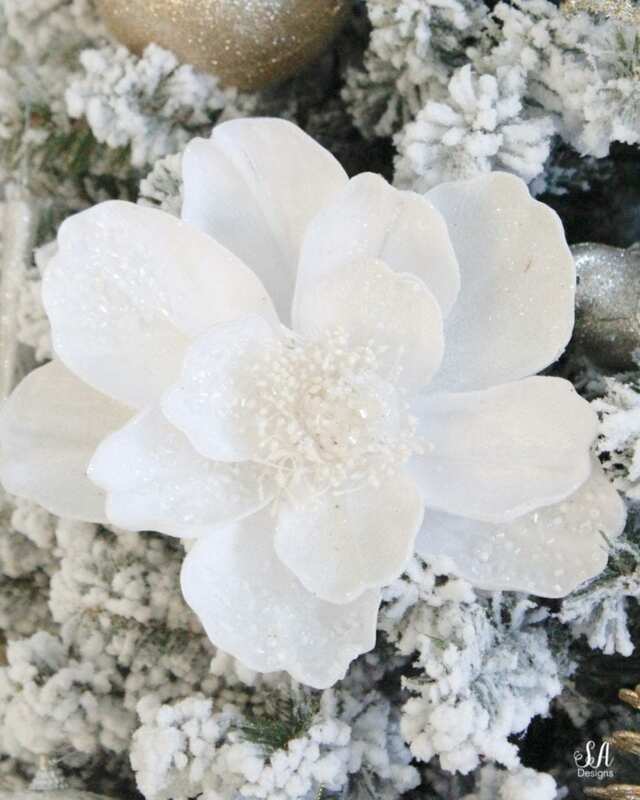 On this tree, I used sparkly Christmas magnolia and poinsettia stems. I cut pieces of this pretty tinsel wired ribbon in pieces around 12-18 inches and just tucked them in the tree all over. 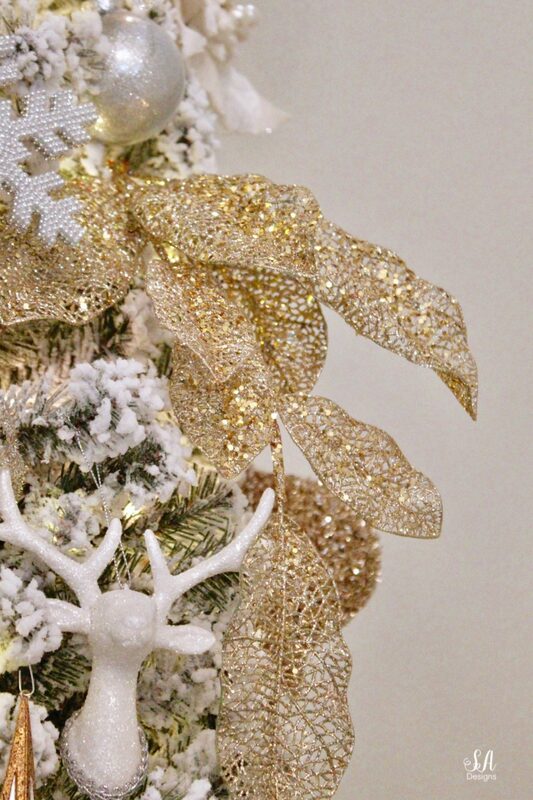 I used gold glittery and metallic leaf stems and places them throughout the tree. Then I grabbed all my ornaments I’ve collected over the years and also the pretty gift boxes and matching wrapping paper. As I do more gift wrapping, you’ll see a post on all my creative and beautiful ways I like to wrap gifts. Make sure to come back for that! 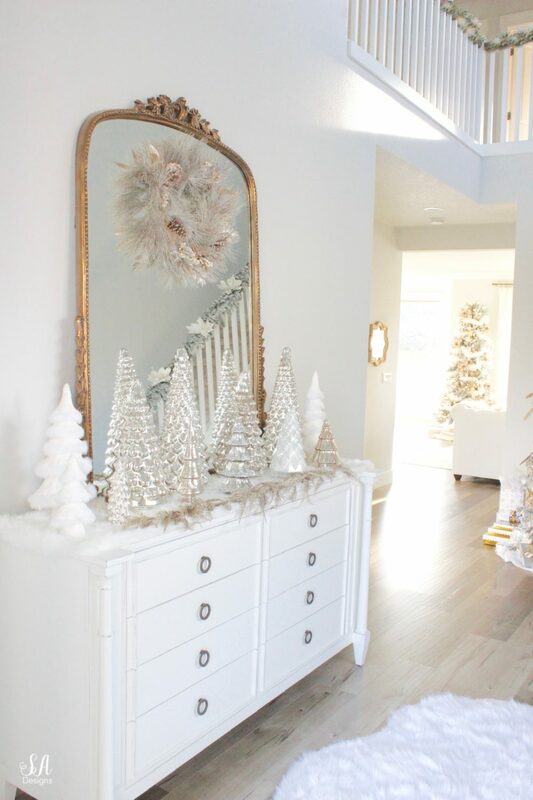 A cozy faux fur settee to sit on and take off and put on your shoes is the perfect piece to have here in this elegant Christmas entry way. Next week I’ll share a fun and easy Christmas DIY for this area so stay tuned. I recently made these glitter jeweled candle rings. 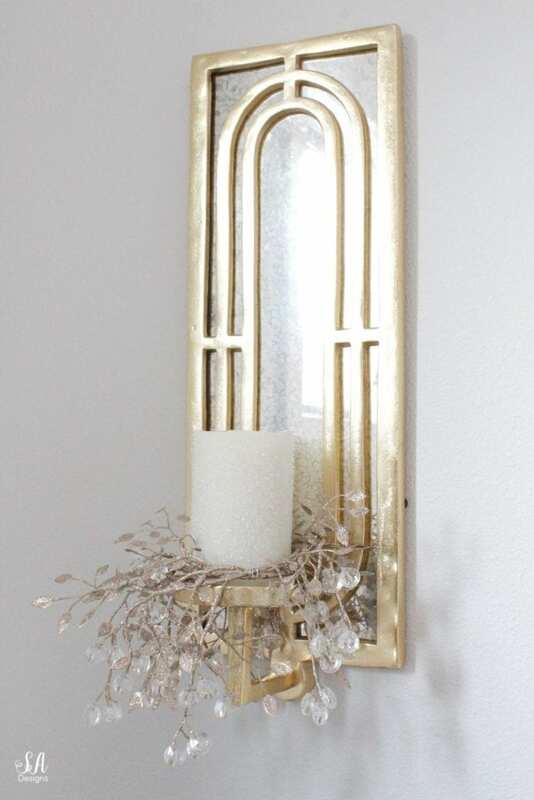 I had made them for my candlesticks but then decided I needed a couple more for these wall sconces on the sides of the front door and it looks so perfect for the holidays. Look for a tutorial on these in just a few days! 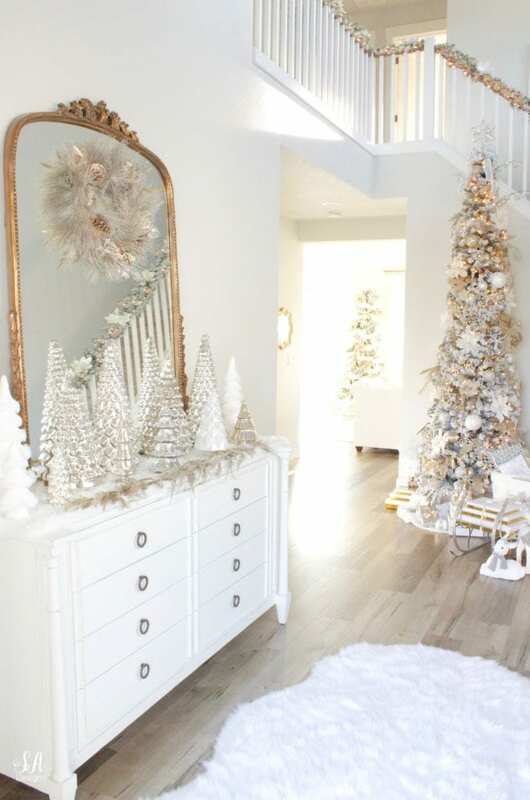 You’ll hear it said that faux fur throws, pillows, rugs, and just about anything else faux fur is a MUST as Christmas nears and as the temperatures drop. I would also say that a stunning faux fur coat is a winter essential for the holiday season and should be a staple in your wardrobe capsule. This soft ivory coat is one of my absolute favorites! I love that I can put it on with a skirt, dress, or pants but also a sparkly top with jeans and heels for a dinner or holiday party. Whether you dress it up or dress it down, it’s the perfect coat for all your events this winter. My favorite thing on a cold winter morning is to dress in a warm robe and slippers and head down to breakfast and make some tea. When I saw Pottery Barn’s new robes and slippers this year, I just knew I had to have a specific set. The Dune Leopard Faux Fur Hooded Bathrobe and the matching slippers have become my new favorite set. The robe is the softest and most comfortable one I’ve ever worn. 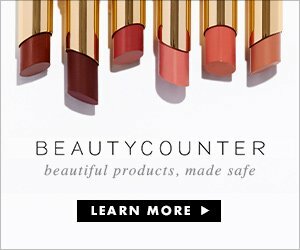 I couldn’t believe how amazing it felt against my skin. It kept me so warm and cozy and was the most perfect thing to put on and sit in front of the fire with my while drinking my morning tea before church last week. The hood on it was a brilliant part of the design. When I step out of the robe and have wet hair, it’s so nice to put on my robe and head downstairs while staying warm. It feels so luxurious it is without costing a fortune. This would be the most perfect gift for any woman, don’t you think?! 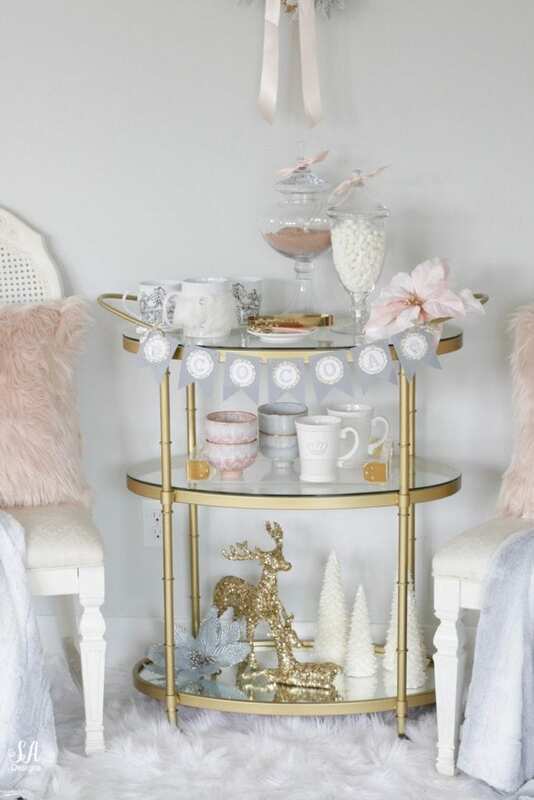 Not far from our fireplace, we have our hot cocoa bar cart set up. If tea isn’t your thing, we have hot cocoa and it’s always available so that our guests can grab a cup when they come in from the cold. Brooklyn & Beckham (and their friends) love coming home from school and making themselves a hot cup of cocoa with marshmallows and warm up by the fire. Read the post on my hot cocoa bar cart here. 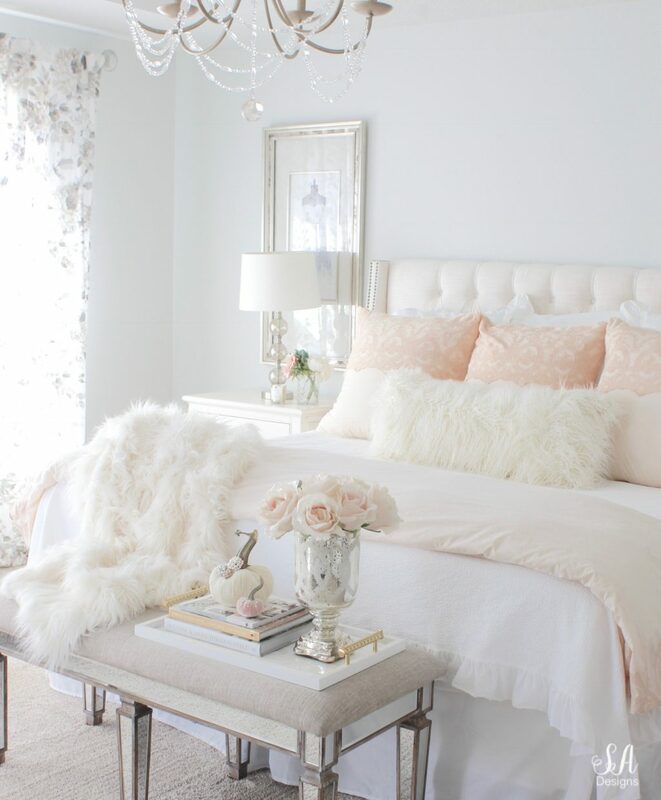 I also chose the champagne blush faux fur ruched throw from Pottery Barn for Brooklyn’s bedroom. 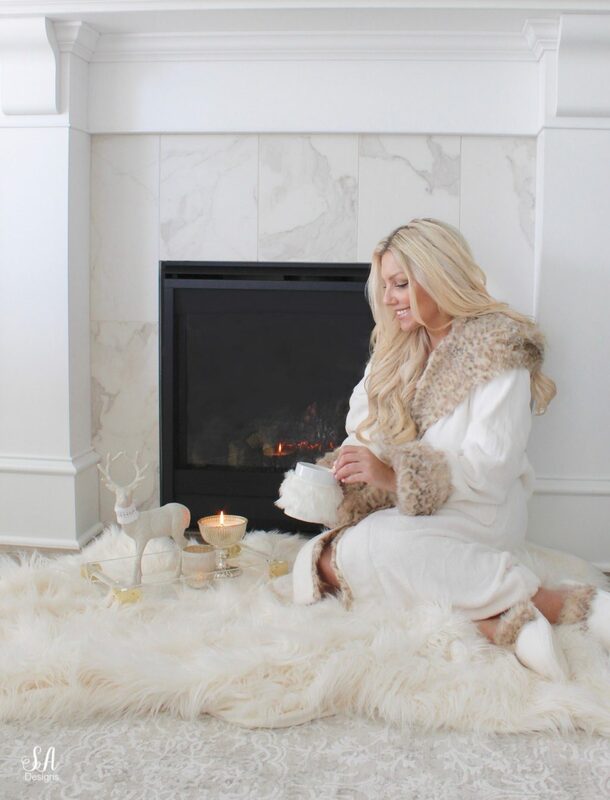 I love switching out all of my lighter throws for fabulous faux fur throws in the fall and winter and my family just loves getting cozy with them and enjoying that soft feel against their skin. 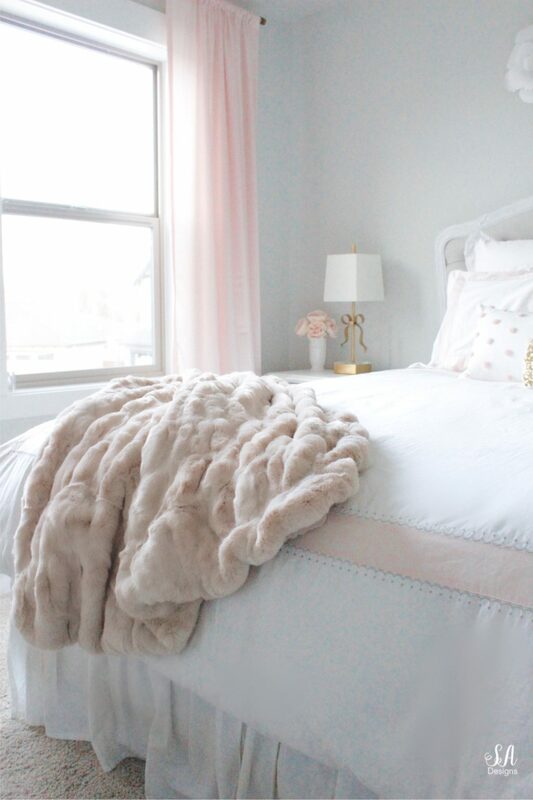 If you saw my fall & winter bedroom post already, you know how much I love this other faux fur throw blanket from Pottery Barn Teen. 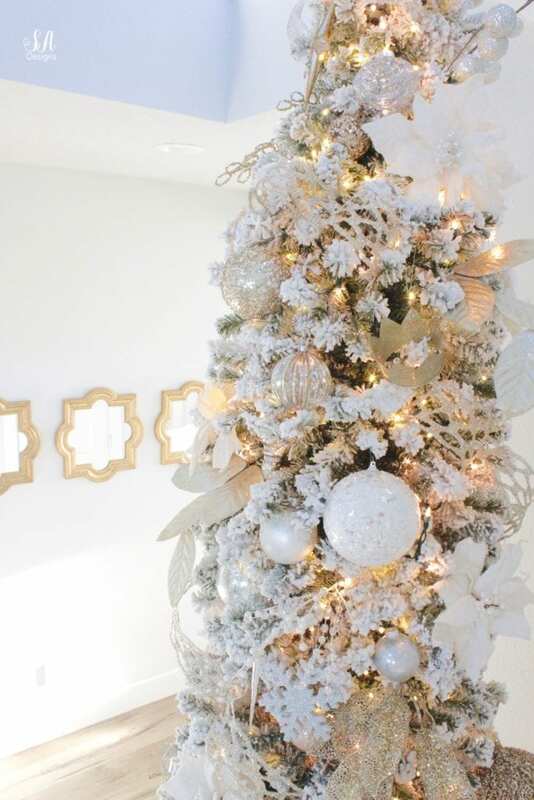 Isn’t it so pretty draped over my bed? I also purchased that long faux fur lumbar pillow from Pottery Barn for my bed and it just makes my bed look so inviting and cozy after a long cold day. 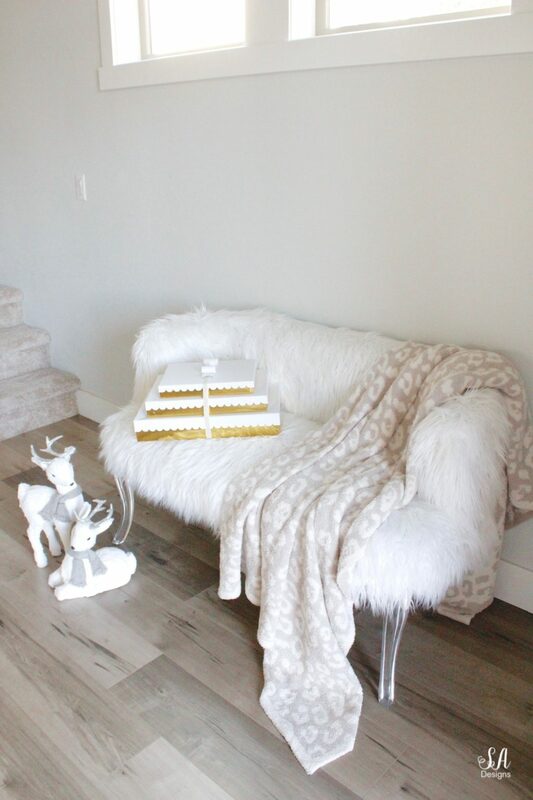 I feel like every bed and sofa needs a faux throw in the winter. Starting tomorrow, I’ll be revealing my living room mantel, then my other Christmas trees, including this year’s blush office tree (see last year’s office tree HERE), my Christmas kitchen, Christmas tables, touches of Christmas decor in our bedrooms, AND our new bonus room makeover with touches of Christmas as well. 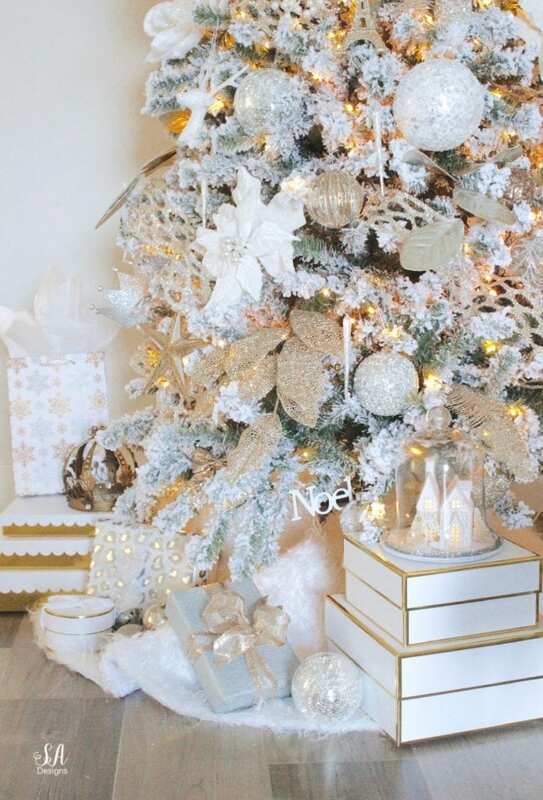 I have more holiday traditions, recipes, pink gingerbread houses and the prettiest gift wrapping ideas coming too so stay tuned! 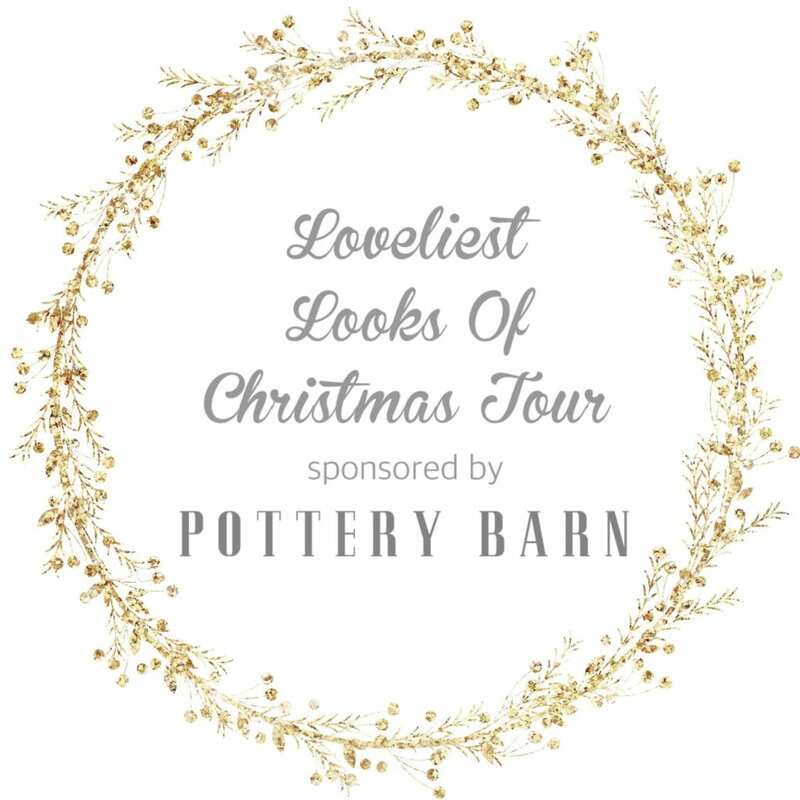 Thanks so much for stopping by today for our Loveliest Looks Of Christmas Tour! I would love it if you could subscribe at the top of the page in order to receive my weekly emails of all my latest blog posts and see everything I’m working on! You can also follow me on Instagram, Pinterest, and Facebook to see what I’m up to in creating a home and lifestyle of inspiration! It’s so beautiful Summer!!! Winter wonderland! Those trees are just beautiful and I love your gorgeous coat! 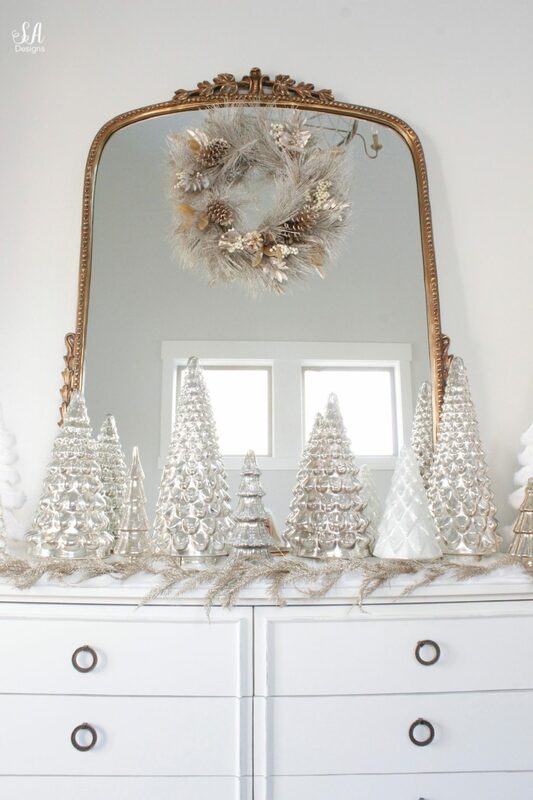 What a warm and welcoming way to come into your home for the holidays! 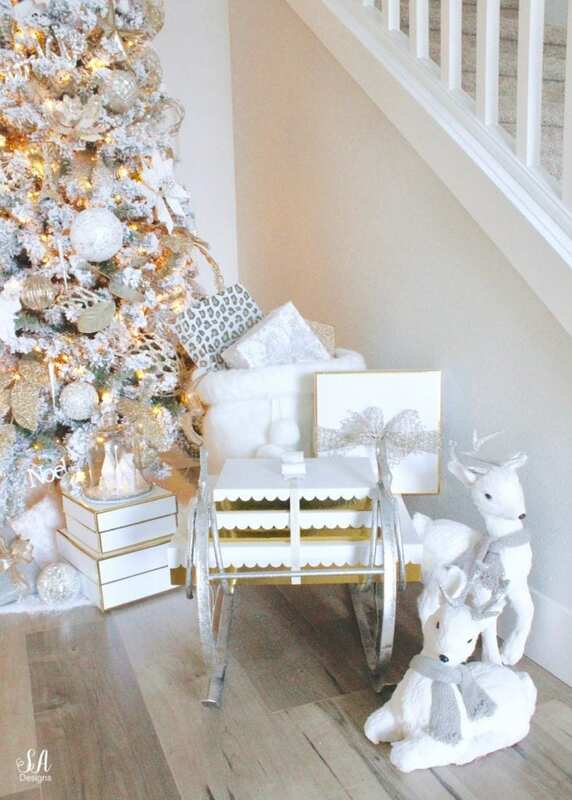 I love your gold and silver accents and all the cozy fur! Everyone’s home has been so beautiful. Such a wonderful tour! Wow your home is gorgeous! But I do have to say I was a little distracted by your gorgeous face!!! Yowza!!! 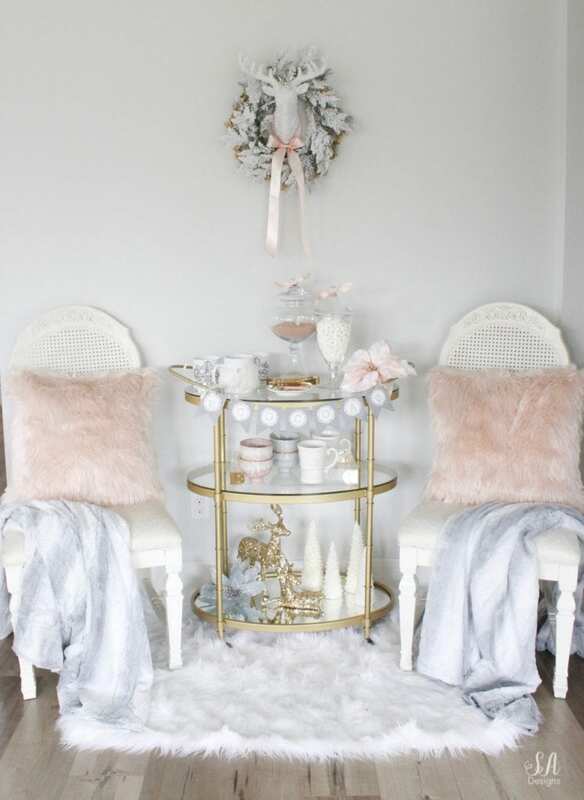 What a gorgeous set up!! Love it!! 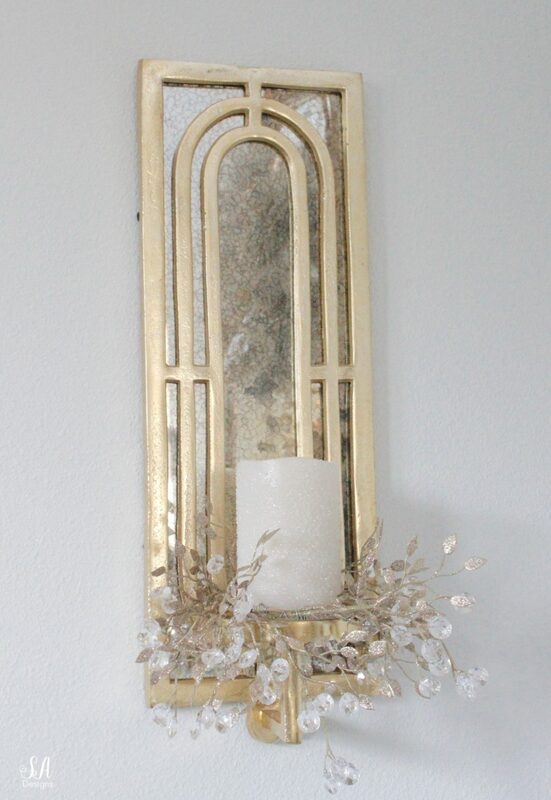 So impressed with your beautiful space! Everything looks so beautiful! Love the faux jacket and the robe + slippers. Can’t wait to see more. Wow!!! Everything is stunningly beautiful! I need that robe and darling coat! You did a fantastic job!